food | Where Outside Is In! It’s Time for Oktoberfest in Reston Town Center! Get ready to fill your tankards and sing some German folk songs; Oktoberfest is coming back to Reston Town Center October 5-7, 2012! 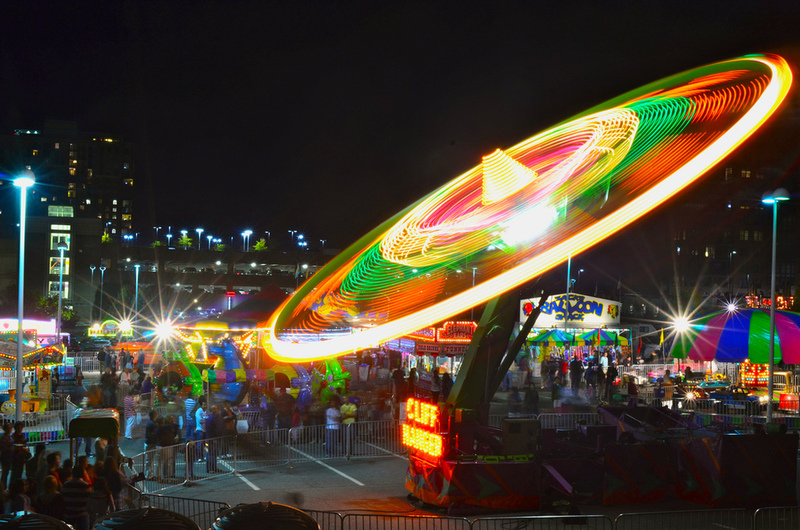 Hosted by the Greater Reston Chamber of Commerce, the 3-day event includes a Saturday morning 5K, food, wine & beer, a carnival, a chili cook off and live entertainment including traditional German music and dance. Whew! Sounds like a quite a weekend, so let’s get down to details, shall we? Of course the beers and wines will also be available throughout the festival. In true Oktoberfest fashion, seasonal beers like Shock Top’s Pumpkin Wheat and Dominion’s Oktoberfest will be available along with some perennial favorites such as Beck’s, Bud Light, and Widmer. 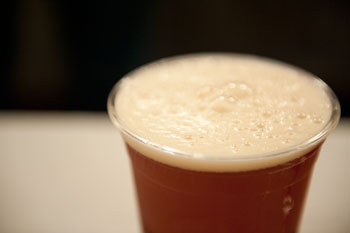 For those who love microbrews, there will be a couple craft beers on tap near the Library Street stage! And for those poor souls who can’t or don’t like beer, Market Cellars and The Wine Cabinet will have wine available near the Pavilion! Saturday features a few activities unique to the Oktoberfest weekend! The morning kicks off at 8:15 am with the Anthem Pumpkin 5K, offering a quick route around Reston Town Center and the surrounding community. The 5K is followed by the Pumpkin Smash Mile, a non-timed mile long party with Halloween costumes and tons of enthusiasm. Participants with the BEST costumes will be awarded prizes, honor and bragging rights. And lastly, the smallest ones get to decorate pumpkins and compete in the Pumpkin Dash, which also encourages fun and costumes! Online registration is open through October 2, otherwise, you can register at packet pickup on October 5, or on-site before the races on October 6. Since the runners loop back to the Pavilion prior to Oktoberfest kicking-off, the Scrambled Legs Breakfast will be open for post-race refueling, including fall brews of course, and the carnival will open early and offer unlimited-ride wristbands! Of course, runners are encouraged to stay and enjoy all the festivities – Oktoberfest opens at 11 am! If you’re still hungry after the Scrambled Legs Breakfast, you won’t have to wait very long before the Guns ‘n Hoses Chili Cookoff at noon where the Police Department and the Fire Department square off in a battle of brute cooking skills. You will need to taste the competition very, very carefully before deciding on your “People’s Choice” vote. The award ceremony starts at 4 pm, so make sure you’re there when they announce the champion! It wouldn’t be a festival without live entertainment! Traditional German music and dance will fill the streets all three days. Then at night, the Pavilion will rock out to this line up: Friday night, Gonzo’s Nose, music from the 80s to today; Saturday night, 2U, a U2 tribute band; Sunday night, Almost Journey, as you could guess, a Journey tribute band. And, as with any great event, volunteers are always a must! If you would like to participate in the event in a slightly different way (and get a few free tickets and a tee-shirt for your efforts!) sign up here. This is the fall festival that really has something for everybody, so come ready to drink some brews, eat good food, ride the rides and get in the autumn spirit. For ticket sales and other updates, follow us on Facebook or Twitter, OR, follow Oktoberfest on Facebook. 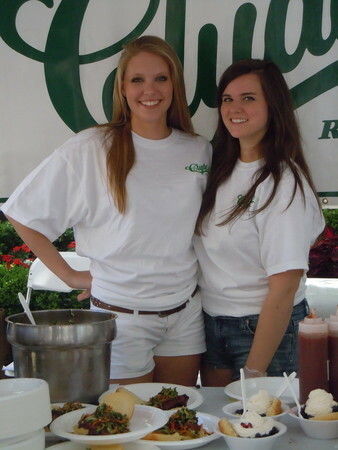 We look forward to seeing you at Reston Town Center – Prost! 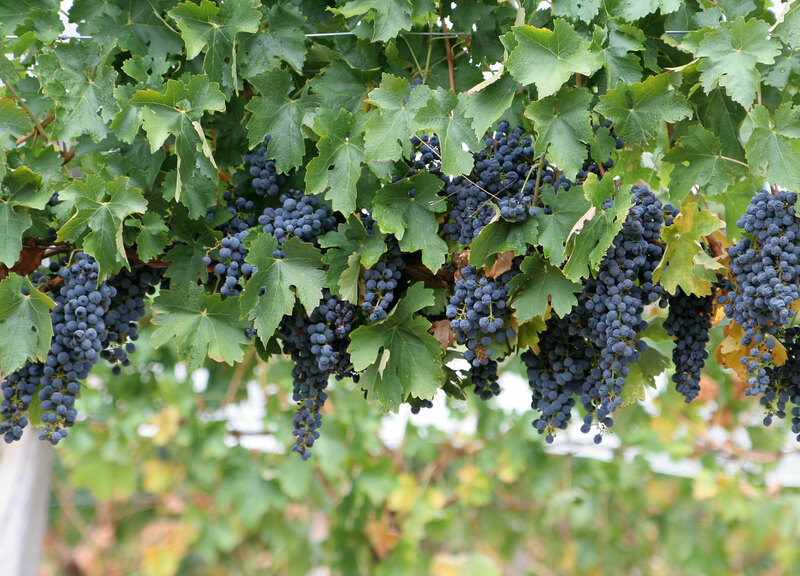 Great Grapes, It’s Time to Taste the Fall Harvest! 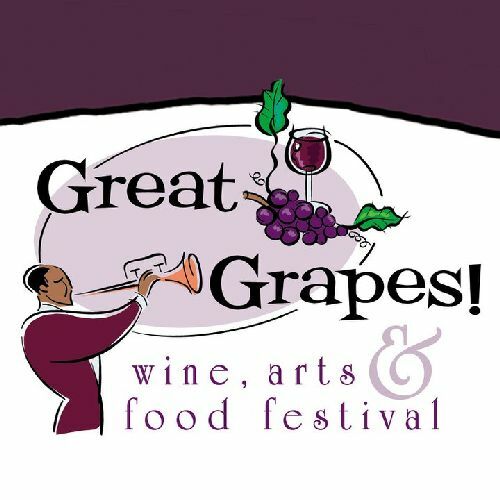 It’s only been a few months since Reston Town Center hosted the spring Great Grapes Wine, Arts & Food Festival, but now the cooler weather is about to set in, it’s prime wine season and the fall festival is coming up September 8 & 9! Cooper Vineyards in Louisa, VA won eight awards with their 2010 Norton Reserve. Made of 100% Norton grape, it has a deep purple color and a robust burst of fruity, silky flavor and tannins that are best tamed by letting it breathe first. Mattaponi Winery in Spotsylvania, VA, is best known for its Odeimin (meaning strawberry) wine that has won seven awards. It is a light dessert wine made from local strawberries that hints of the fruit starting sweet, but not overly sweet, and finishes with a tart lingering flavor on the palate. Democracy Vineyards in Lovingston, VA, has an eight-time award-winning wine, the Velvet Revolution Reserve 2009, which is a varietal with an explosive complexity that’s a mixture of cherry notes, deep tannins and a nutty, dry-yet-still-fruity finish. The equal parts Cabernet Franc, Chambourcin, Merlot and Petit Verdot round it out for a well-balanced wine. The Williamsburg Winery in Williamsburg, VA, has their barrel-aged Acte12 Chardonnay 2010, which is an eight-time award winner. It is a smooth, toasty chardonnay with a strong buttery finish that leaves a creamy sugary taste on the palate. Potomac Point Vineyard & Winery in Stafford, VA, has the best Viognier of the East Coast according to the Beverage Wine Institute. The Richland Reserve Viognier 2009 has a golden yellow color with gentle, yet complex aromas of tropical fruits such as citrus, and dragon fruit yet with a creamy banana and coconut custard finish. This is a well-balanced wine with a crisp medium-to-full-body taste. And lastly, don’t miss the Unicorn Winery in Amissville, VA – we can’t speak to their wines, we just love the name! So now you know about a few of the great wines that are going to be at the festival, grab your tickets (a percentage of the proceeds go to Spirit of Hope Children’s Foundation!) and get ready to uncork the fun! If you can’t make it to the festival this season, don’t worry, Reston Town Center has plenty of delicious wines to taste at our restaurants or grab a bottle at our specialty shops like Market Cellars! Calling all Foodies! Not to brag, but Reston has some of the best restaurants in Northern Virginia and we get the honor of showing them off each year. Last weekend Reston Town Center was crowded and bustling with sights and smells from Taste of Reston & Carnival, presented by the Greater Reston Chamber of Commerce and voted “Northern VA’s Best Food Festival” this year by Virginia Living. Over 20 restaurants participated, giving the festival a broad culinary palette fit for any gourmand. A few favorites were Clyde’s of Reston’s Asian chicken sandwich covered in a teriyaki glaze which won top prize from the panel of Chamber of Commerce judges. Paolo’s Ristorante captured third place with their sweet yet spicy and savory meatball spiedini – traditional Sicilian meatballs skewered for an Arabic cooking style. Il Fornaio’s mozzarella caprese was a beautifully presented classic – fresh mozzarella and a whole basil leaf seasoned and served on half a tomato – as an example of Italy’s simplest flavors combined. Sweetgreen’s cesar salad/wrap was light and refreshing featuring Sweetgreen’s locally sourced ingredients, which is the secret to their crisp success. The newest features of the festival were the Wine ‘n Dine cooking demonstrations and wine tastings. Some of the top chefs in the area demonstrated their favorite cuisine and cocktail recipes to taste along with wine pairings. Learning how to re-create a delicious meal at home is the highest form of flattery a foodie can pay to a chef’s skill and creativity. 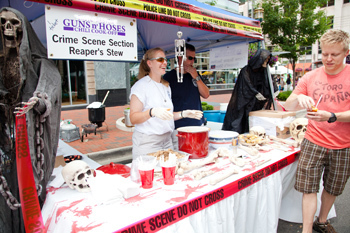 And if you missed the festival, don’t worry, it’s hosted at Reston Town Center every June, and in the meantime we have loads more mouth-watering restaurants to try like M&S Grill that has some of the most fresh, complex gazpacho in town with its glory of crab and avocado toppings. Busara Thai Cuisine is known for its traditional Pad Thai, Pad Woon Sen, and vegetarian tofu dishes with that authentic Thai kick to them. And if you’re craving Mexican, you can’t go wrong at Uncle Julio’s Rio Grande Café with their margaritas, fajitas al carbon or BBQ chicken quesadillas, gooey with cheese and sauce, but only served on Mondays and Fridays. So explore Reston Town Center’s culinary offerings, you won’t be disappointed, and bon appetit!